Will Game Publishing Be Enough to Save GameStop Corp? The video game retailer just launched an in-house game publishing label as its next major avenue of growth. GameStop (NYSE:GME) recently introduced GameTrust, an in-house game publishing label. Its initial partners include Ratchet and Clank developer Insomnia Games, 1886: The Order developer Ready at Dawn, Trine developer Frozenbyte, and Deadlight developer Tequila Works. GameTrust's first game, Insomniac's Song of the Deep, will launch in June in its own stores and on PlayStation Plus, Xbox Live, and Steam. This bold move might help GameStop diversify away from its core brick-and-mortar business of selling physical games. The company -- which also sells digital games, collectibles, consumer electronics, and mobile devices -- believes that physical video games as a percentage of its operating earnings will decline from 75% in 2015 to 50% by 2019. That transformation could counter the bearish belief that GameStop will be rendered obsolete by digital downloads from Steam, console makers, and publishers' own DRM platforms. In a recent interview with GameSpot, GameStop VP of Internal Development & Diversification Mark Stanley said that GameTrust wouldn't interfere with the developers' creative process. "By allowing developers to fully focus on their craft," Stanley stated, "GameTrust can focus on all other aspects of bringing a new IP to market -- leveraging our deep expertise and retail channel leadership to support each developer and connect their games with a broader global audience." Stanley's description of GameStop's relationship with GameTrust as "light-touch" could be appealing to developers who previously dealt with publisher interference. Electronic Arts (NASDAQ:EA), for example, has been widely criticized for buying out and "gutting" promising studios like Westwood Studios and Pandemic Studios to control their IP. Activision Blizzard (NASDAQ:ATVI) fired the founders of Call of Duty developer Infinity Ward over "insubordination" in 2010, prompting nearly half of the studio's employees to resign. GameTrust will deliver games for a variety of platforms, including consoles, PC, and virtual reality, while covering everything "from casual to serious, console to PC, triple A titles to independent games." GameSpot will offer physical copies of some games, like Insomnia's Song of the Deep, as in-store exclusives, but it will sell the digital copies on rival storefronts like Steam. GameStop will pay those stores a cut of each sale, but it will gain a new avenue to profit from their growth. Can this strategy save GameStop? Publishing games could be a double-edged sword for GameStop. While the move could generate fresh sales growth and reduce the weight of its physical game business, it would also cause operating expenses to rise -- especially if it plans to release "triple A" titles. Activision's Destiny, for example, had a combined production and marketing budget of $500 million. EA's Star Wars: The Old Republic, which spent six years in development, cost $200 million to produce and market. The cost of these games will continue climbing as graphics improve and gamers' expectations rise. Therefore, if GameStop plans to invest millions into creating triple A titles, its promise of approaching developers with a "light-touch" could be tough to keep. 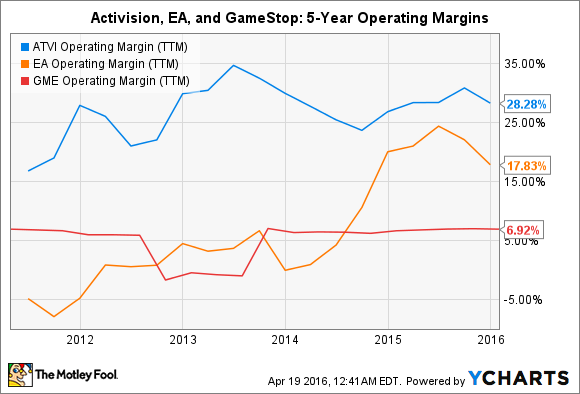 But on the bright side, balancing cheaper casual games with an occasional blockbuster has worked fairly well for Activision and EA, which both have beefier operating margins than GameStop. GameStop revenue rose just 1.4% annually to $3.53 billion last quarter. Sales of video game accessories, mobile electronics, collectibles, and digital games rose, but sales of new physical games fell. Looking ahead, GameStop expects revenue for the current quarter to fall 4% to 7% -- well below the consensus estimate for 1.3% growth -- while same-store sales are expected to drop 7% to 9%. Analysts currently expect GameStop sales to rise just 1.3% this year, and for its buyback-boosted earnings to rise 2.8%. These numbers are weak, but they don't indicate that GameStop will crumble anytime soon. Moreover, the company's solid record of buybacks, its forward dividend yield of 4.7%, and its 5-year PEG ratio of 0.85 should limit the stock's downside at current levels. GameStop's attempt to shift half its business away from physical games by 2019 is admirable, but it's not a magic bullet for the challenges it faces. Digital games could replace physical games at a faster than expected rate, while cloud-based gaming platforms could disrupt traditional consoles. Mobile device and consumer electronics sales could also slow significantly. As GameStop diversifies into new markets like publishing, it risks diluting its brand by becoming a jack of all trades and a master of none. However, if these efforts pay off, GameStop could save itself from becoming the next Blockbuster or Radio Shack.